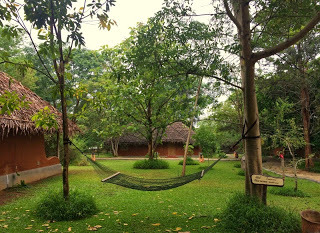 With fantastic trip advisor reviews, my expectations from Orange County, Kabini (OCK) were sky-high! The photos of the resort from their webpage gave me a glimpse, but left me a bit underwhelmed. A short 2 hour drive from Mysore past rather parched farmlands took us there. Kabini is not the name of a village or national park, but of a river that flows through these parts. Originating from the Wayanad District of Kerala, the river joins the Cauvery (another major river system of Southern India) in Karnataka and eventually flows into the Bay of Bengal. In 1974 a dam was built on the river for irrigation purposes. OCK is way past the dam and at one end of the Kabini river. Mud walls with lanterns (typically those that were used in days when there was no electricity) greet us as we approach the resort. We were welcomed by an old man from the Kadu Kuruba (Kadu meaning forest) tribal community (the original inhabitants of the land) who played a traditional instrument resembling a small trumpet. A short corridor past the reception takes you to the main gathering area of the resort overlooking the serene Kabini river. Large herds of cattle grazed on the opposite shore and the jungles stretched out in the distance. 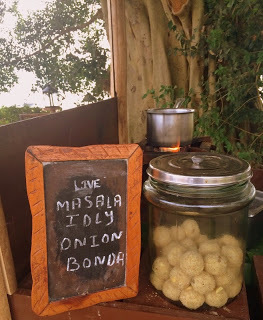 While we sipped on some chilled sugar cane juice and completed our check in formalities, one of the naturalists of the resort took us through the many activities that one can partake in at the resort. 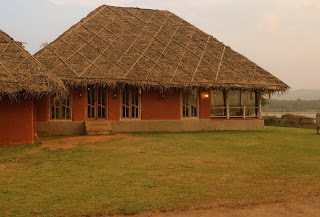 Kabini wedged between the Nagerhole and Bandipur national parks is tiger country! Land and boat safaris offer you an opportunity to see wildlife. 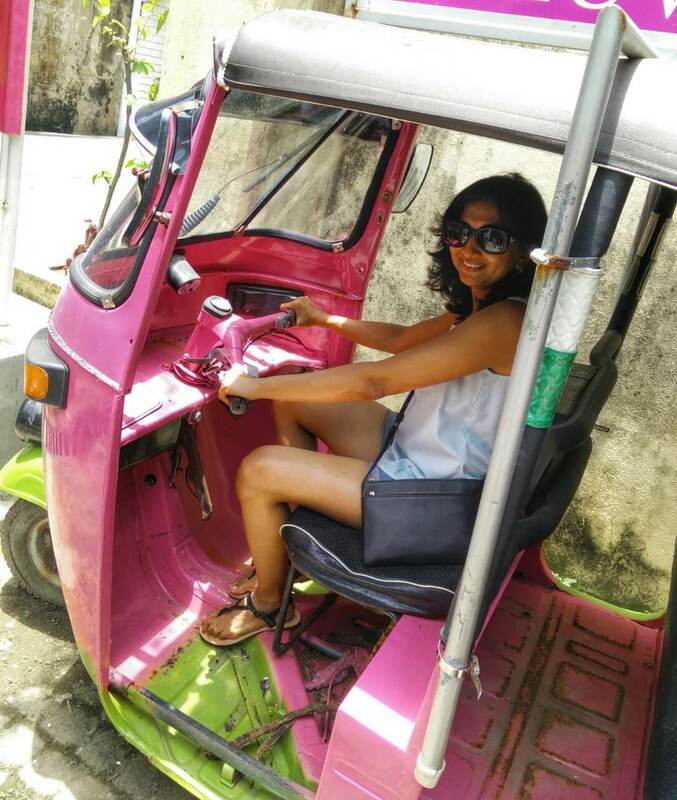 Another fantastic way of getting to know the surroundings is to go on a guided nature walk in the day or at night around the premises of the resorts with one of their well trained naturalists. The highpoint of our visit for my 3 year old daughter was interacting with the resort’s elephant Kaveri. Feeding Kaveri and watching her mahouts scrub her clean in the Kabini river was a fun experience for her. Many of the hotel’s guests went for a short ride on Kaveri or went on a tonga ride (bullock cart ride) along the banks of the river. An infinity pool, a reading lounge with splendid views of the river, a ayurveda vaidyashala (spa) and a separate children’s area complete with a small children’s pool, as well as an interesting and well put together interpretation centre will ensure you are amply engaged throughout your stay. 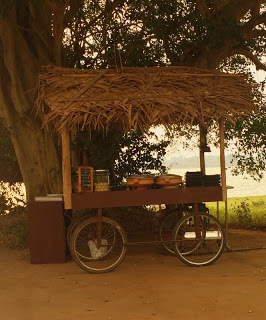 As the sun begins its downward descent, a push cart – typical of street food sold in the Southern parts of India is set up near the infinity pool. Hot chai (tea) or coffee along with some lip smacking snacks are the perfect way of ending a relaxed day spent at the resort, watching the sky turn from blue to crimson to pink and finally a dark grey! The rooms like the main resort building resemble local huts with thatched roofs thus blending with the surroundings. 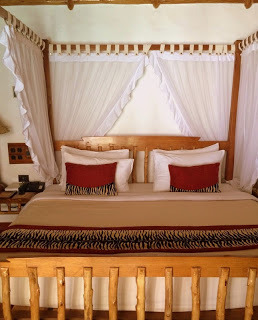 “The resort architecture has a tribal Kadu Kuruba leitmotif, where each of the guest huts bespeaks a happy marriage of traditional craft and modern luxury.” Unassuming from outside, once you step in, the rooms will take you by surprise! 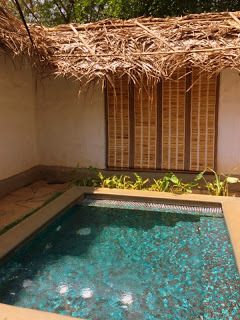 There are jacuzzi and pool huts to choose from. We had a jacuzzi hut that was simply beautiful. 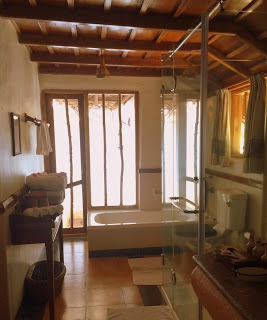 The hut is like a small house complete with a separate living room, with a mini bar and a 4 seater dining table, attached to the bedroom and bathroom. The jacuzzi could be accessed from both the living area and the bedroom. 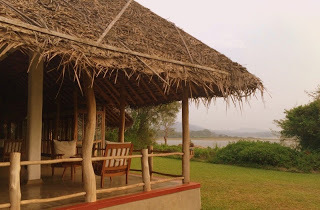 All huts have a sit out and if you are lucky you will get sweeping views of the Kabini right from your doorstep. 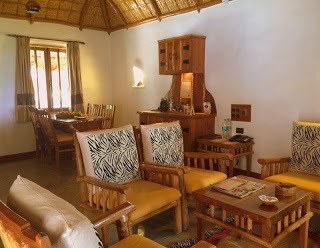 Bottle gourd lampshades, animal print upholstery, solid wood furniture added to the rustic charm of the huts. 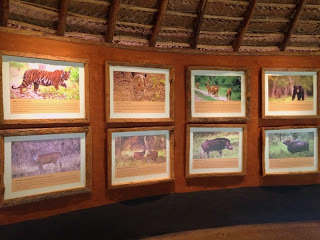 Everything in the hut was impeccably maintained and abundant. The mini bar stocked with assorted nuts, cookies, fruits (gorgeously arranged) and chocolates was complimentary and were replenished time and time again. 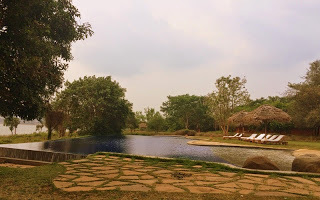 The resorts grounds were sprawling and wild in many parts, thus giving you the feel of being in the forest. I particularly liked walking through the resort and looking at the many native trees and plants found there, duly labelled. As the sun went down the surroundings came alive with myriad insect sounds till everything quietened down with nightfall. Night times at the OKC are not dull! The first night that we were there we saw an interesting wildlife documentary made by acclaimed wildlife filmmaker Shekar Dattatri. The second night we were treated to a local tribal dance performed by the Kadu Kuruba tribals from neighboring villages under the stars. The performance was simple and beautiful, and the naturalists gave an interesting commentary and got us to participate making it a very engaging and lively evening. Many of these local art forms find no patrons today even amongst their own communities and I think hotels and resorts need to do their bit to keep these alive. As beautiful as the resort is, what makes it truly spectacular are the fantastic staff. I have never stayed in a hotel where the staff seemed so happy! The result being many pleasant interactions throughout our stay. The naturalists of the resort are well trained and genuinely passionate about nature and wildlife. We kept bumping into them during our stay and they patiently answered our many queries, always teaching us something new. Have you had any interesting Orange County experiences? If you are wondering if we did see the tiger – do keep following, as that warrants a whole post to itself! Oh! So beautiful. I just loved the name- Kabini. Orange County Kabini has now topped my bucket list. 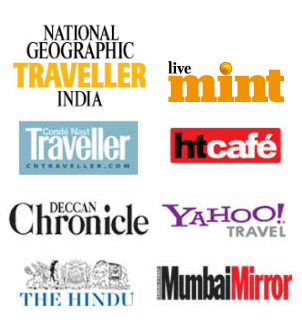 Thanks a lot for sharing your experience…. Thanks Maniparna! I think you will love it too! Sounds like a beautiful vacation! Never been to that part. 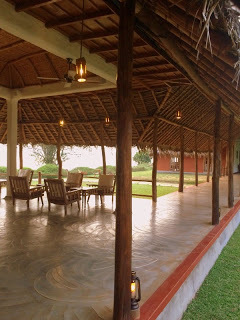 Kabini is absolutely gorgeous! A bit scary too cause you see how close man has come to the wild, and how much we have encroached on our forests! Orange County is fabulous. Wonderful resort. Look forward to those jungle stories.